Price from: $1128 - Book now! Welcome to Luang Prabang, the ancient capital city of Laos! On arrival, you will be welcomed by local tour guide and get transferred to hotel. The UNESCO World Heritage Site of Luang Prabang is perhaps the best-preserved traditional city in Southeast Asia. Well combination of tranquility, splendid natural scenery and cultural sights make it one of the most delightful places to visit in Laos. After check in the hotel, enjoy your time at your leisure. Day 2: Luang Prabang - Pak Ou cave . Following breakfast at the hotel, you will first visit the former king’s palace, which is now a museum. The many items nicely displayed include rare furniture, traditional costumes and arts, jewelry, ornaments as well as working tools and utensils of the early part of the 20th century. Then, drive out to Ban Xanghai, also known as the whisky village where the local make their wine lao lao from rice. Next, you will walk down to the pier to board a local motorized boat cruising along Mekong to the mysterious Pak Ou caves exploring these mysterious caverns, filled with thousands of gold-lacquered Buddha images. Later, on the way back to Luong Prabang you will visit Ban Xieng Khong and Ban Xieng Lek which are very famous for making Saa Jute paper. Back to Luong Prabang, join us on a climb up to Phousi hill, the highest point in the area, to admire the panoramic view of the town at sunset. In the evening, you can either relax in the hotel or explore the nearby Night Market on your own, where you can find an expansive collection of textiles, hand-woven by the local hill tribe people. For the early risers, we suggest you should participate in the daily morning rituals of saffron-clad monks collecting offerings of Alms (ubiquitous sticky rice) from the faithful residents. This tradition is very unique in Laos, being the only Buddhist nation still preserving the procession. After breakfast, enjoy a tour of the city. Your circuit begins with Wat Xieng Thong, perhaps the most photographed temple in Luang Prabang. In the late morning visit the unique Wat Visoun, entirely rebuilt after its destruction in 1887 by the invading Black Flags from southern China. In the courtyard of Wat Visoun stands the Watermelon Stupa, which is shaped like the fruit it takes its name from. In the afternoon, transfer to the airport to catch the flight to Siem Reap, the provincial capital and gateway to the ancient Angkor temples. Recognized as a World Heritage Site by UNESCO, the Angkor Archaeological Park encompasses dozens of temple ruins including Bayon, Banteay Srei and the legendary Angkor Wat. Upon arrival, you will be welcomed and taken to the hotel to check in. We begin the busy but interesting day by a drive from the hotel to the jungle-covered temple of Ta Prohm, a wonderful combination of human genius and natural beauty with its giant trees that have grown there for centuries. The temple became more famous after Tomb Raider was filmed there. Afterward, proceed further to visit Banteay Srei, best known as the women’s citadel. This beautiful temple was built in 967 AD by Jayavarman V's guru, it showcases the most exquisite, deep and complex carvings in all Khmer architecture. After lunch (your own account), explore the enigmatic faces of Bayon Temple, regarded as the heart of Angkor Thom. Move to the Terrace of the Elephants, a platform where King Jayavarman once surveyed his army. Close by is the Terrace of Leper Kings, which includes a statue depicting Yana, the Hindu god of death. Later, visit the South Gate of Angkor Thom - the beautiful and old gate with its majestic doors and artifacts. Day 5: Siem Reap - Angkor Wat - Beng Mealea. Rise up early for a transfer by tuk tuk to the magnificent Angkor Wat. The trip is designed for you to see “the spiritual Temple reflex on the water” at dawn- the haunting, cooler and less crowded moment. As the UNESCO World Heritage Site, Angkor Wat where the Hindu God Vishnu is dedicated was constructed by Suryavarman II who reigned Cambodia from 1113 to 1152. The plan of the pyramidal conception of the temple combined with spaces, alleys and ditches is an ancient masterpiece of architectural design and construction. After breakfast, we drive further to Beng Mealea Temple and explore the abandoned temple (11th century), strangled by the jungle. On the way back, stop at the Old market where the local still trade the old way. Day 6: Siem Reap Cooking Class - Rolous Group- fly to Phnom Penh. Discover the secrets of authentic Khmer cuisine in a half-day cooking class, first begin with a walk to local food market where you will learn about Cambodian vegetables, herbs, and other ingredients. After dining on your creations, transfer out of town to the ancient capital of King Indravarman I (877-889) now referred as the Rolous Group and known as the birthplace of classical Khmer art and architecture. Then, go to the Siem Reap airport to catch your domestic flight to Phnom Penh, the city of historic sites, old French building, boutique and bistro, just let yourself lost in this commercial and political hub. Today we discover Phnom Penh major sites, begin with National Museum, an excellent introduction into ancient Khmer art and civilization, and the Royal Palace, home to the royal family and the opulent silver pagoda. 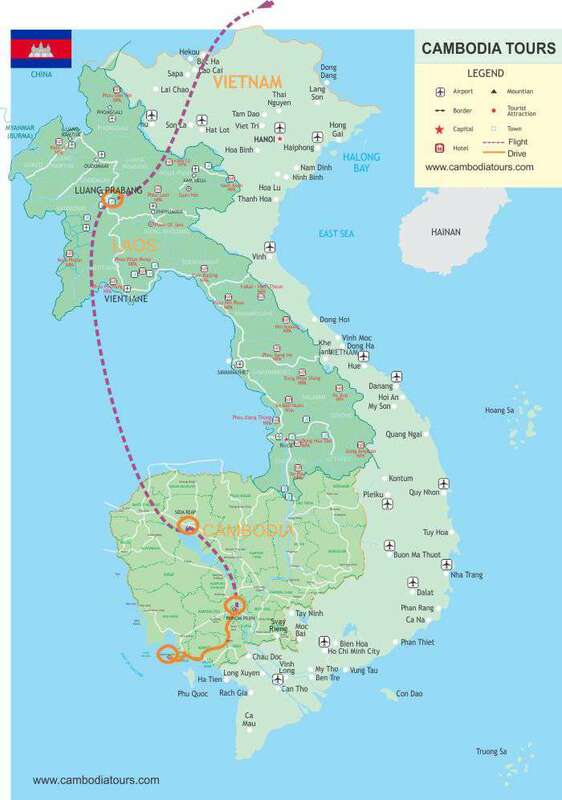 After lunch break we head to the Mekong Islands, about 20km from Phnom Penh to the north by crossing Tonle Sap River and Mekong River by private boat. Take a leisurely bike ride along the countryside of a Khmer community to visit the weaving village is a typical rural Cambodian village, dedicated almost entirely to silk weaving - people operating hand looms under most of the houses, others dying and spinning silk on spinning wheels made of bicycle parts. Return Phnom Penh and relax. Begin your morning with breakfast at hotel then set out to see the historical part of Capital. A visit to the Tuol Sleng Prison Museum and the notorious ‘Killing Fields’ provides a deep insight into the painful bloody rule of the Khmer Rouge. After your lunch in the city (on your own budget), take a 5 hour- drive to Sihanouk Ville which is popular for its natural beauty and largely untouched beaches. Sihanouk Ville also known as Kampong Som, is a province in southern Cambodia on the Gulf of Thailand. This port city is a growing Cambodian urban center, located 226 kilometers southwest of the Cambodian capital. Upon arrival, check in the hotel and then enjoy the rest of time at leisure. Relax on a beach, or take one of the many activities here from visiting fishing villages to seeing offshore coral reefs. After breakfast at the hotel, enjoy your free time until the direct transfer to the Phnom Penh. Rest of the day is free at your leisure. You may spend this day to shop some souvenir for family. Today we drive to Phnom Penh International Airport for your flight home.